Does anyone oil their scalp and see good results from doing this? If you do this, do you do it once or twice daily? I only oil my scalp when it's dry with jojoba oil or shea butter and even then it's not my entire scalp just the dry bits. My way of oiling the scalp is spraying daily with oil/water/EO mixture. My scalp is desert dry without this. Thanks girls! I need to start doing this more regularly. I oil my scalp once a week. I oil my scalp with a teeny tiny bit of coconut oil every night and massage well. 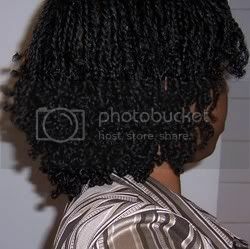 I never oil my scalp because I was told that it blocks the pores and keeps hair from growing. This does make sense to me but when I was a child I would get my scalped "greased" and my hair was its healthiest when I was that age. Hmm maybe I need to get out the grease again. I oil my scalp several times a week with my home made butter (avocado butter, coconut oil, avocado oil and cactus leave in all whipped together). I use this same butter on my hair for twists and twist outs. My hair and scalp drinks it up. I don't oil my scalp and I don't regularly oil my strands. I may use a nickel sized droplet of hair lotion once a week but that is on the strands. To make the butter simply take whichever butter you prefer (I'm now alternating between avocado and shea butter) and place it in a mixing bowl. I use all of my butters at room temperature. I prefer not to soften in the microwave because I like to know what consistency I'm going to end up with. Last I whip everything together with an electric handmixer; this is what gives it it's buttery consistency. I use this particular butter on my hair AND skin. The great thing about this is that you can experiment with whatever products and concentrations you like. Because I don't use any kind of preservative, I only mix in small batches that will be gone in 1 or 2 weeks, and when the wheather warms up I'll put the butter in the fridge until I'm ready to use it. Again, I'm sorry for taking so long to reply! I've never understood the point of this. Will someone explain? What's causing your scalps to be dry? Spiderlashes5000, some people may have scalp conditions that they think are aided by oil like dandruff, psoriasis, etc. Not sure. Maybe the others who oil their scalp will clear it up. But this is untrue, right? Dandruff and psoriasis aren't cleared up by oiling one's scalp? the scalp is skin too so it can get dry just as skin does. some oils do help with eczema like flax seed oil and some oils are good for hair growth like castor and coconut oil. currently use Redken butter treat and allsoft conditioner, looking for my HG! Niaoli, is there a general concensus about the growing properties of castor/coconut oil or are you speaking from personal experience? I hardly use any product but I would not pass on something actually good for my hair. For me, oiling my scalp goes back to my childhood when my mother used to do it. Back then I suffered from dry scalp, but thinking back on it, it was probably because of the mineral oil and petroleum filled grease that my mother used to use (who knew back then ). Now that I do know better, I doubt that my scalp is actually dry, but I continue to do it because I know that the ingredients that I use are healthy and nutritious for my scalp (which is skin). So when I apply my butters to my scalp I know that it penetrates the scalp and is good for it. So now instead of "greasing my scalp", I like to think of it as "feeding my follicles"
Is it necessary? In my case, probably not, but I like to do it anyway. There may be others who for whatever reason do suffer from dry scalp ie the follicles don't secrete enough natural oil and so they choose to supplement by adding oil to the scalp. Gotcha. And the manual stimulation is always good, too...gets the blood flowing.